MONTREAL, Jan. 25, 2019 (GLOBE NEWSWIRE) -- Kintavar Exploration Inc. (the “Corporation” or “Kintavar”) (TSX-V: KTR) (FRANKFURT: 58V), is pleased to announce that the Corporation has entered into a letter of intent (“LOI”), with an arm’s length party, with respect to the acquisition by Monster Exploration the 100% interests in the Anik gold project (“Anik”) for $5 million in shares. Monster Exploration is the proposed spin-out (the “Spin-Out”) of TomaGold Corporation (TSX-V: LOT) of all its interests in the Monster Lake (joint venture with IAMGOLD – 50%) and Irene Lake exploration projects. It is expected that upon closing of the transaction, Kintavar will own approximately 14% of Monster Exploration. For full details, please refer to TomaGold press release from January 25, 2019. 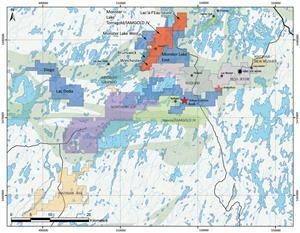 As a result, the new consolidated Monster Lake sector will consist of 610 claims covering 311 square kilometres. "As Kintavar continues to advance its flagship Mitchi stratiform copper project, the opportunity to sell the Anik gold property and to get exposure to the Monster Lake deposit, which has a high-grade inferred resource of 1,109,700 tonnes at 12.14 g/t Au, for 433,300 ounces of contained gold, brings enormous value to Kintavar shareholders. The combined assets of Monster Exploration consolidate a major land package in what is becoming Quebec’s most promising new gold district underpinned by the Monster Lake and Nelligan projects where IAMGOLD is conducting exploration.” comments Kiril Mugerman, President & CEO of Kintavar. The Anik gold project is located 40 km southeast of the town of Chapais and 55 km to the south of the town of Chibougamau, in Québec. The project consists of 120 claims totalling 6,700 hectares. Most of the project area can be accessed via the gravel road linking the former Joe Mann Mine to Route 167, a paved road connecting the Lac Saint-Jean region to Chibougamau. The nearby towns of Chapais, Chibougamau and Oujé-Bougoumou provide facilities and a workforce for exploration and mining development. The southeast claims block is crossed by a Hydro-Québec high-voltage power line. Located in the Opawica-Guercheville deformation corridor, host to several gold mines and deposits, the eastern portion of the property is located less than 7 km from the Joe Mann mine and the Lac Meston and Philibert deposits. The western portion of the property is located less than 10 km to the south of the Monster Lake and Fancamp gold projects. In addition, the main gold zones of the Nelligan property, a joint venture between Vanstar Resources and IAMGOLD, are surrounded to the north, south and east by Anik property boundaries at a distance of less than 1,500 metres. TomaGold and Kintavar have entered into a letter of intent whereby Monster Exploration will acquire 100% of Kintavar’s interest in and to Anik and the related assets and liabilities comprising Anik (the “Anik Transaction”), including: (i) the right of Société de Développement de la Baie James (“SDBJ”) to be granted a 0.1% net smelter return royalty affecting Anik, which may be purchased for C$125,000, the whole pursuant to the terms and conditions of a financing agreement entered into between Innord Inc., a subsidiary of Géomega Resources Inc., and SDBJ and (ii) the right of Administration Régionale Baie-James (“ARBJ”) to be granted a 0.1% net smelter return royalty affecting Anik, which may be purchased for C$125,000, the whole pursuant to the terms and conditions of a financing agreement entered into between Innord Inc. and ARBJ. The consideration for the Anik Transaction will be $5,000,000, payable by the issuance to Kintavar of common shares of Monster Exploration, at a deemed price per share equal to the Financing price, at the closing of the Anik Transaction (the “Anik Consideration Shares”). The Anik Consideration Shares will be issued to Kintavar pursuant to a prospectus exemption under Canadian securities laws and will be subject to a hold period of four month and a day in Canada. The Anik Transaction is subject to certain conditions, including (i) the completion of the Financing and the Spin-Out before or concurrently with the Anik Transaction, (ii) the appointment of two directors of Monster Exploration by Kintavar and (iii) the approval of the TSXV. Kintavar has agreed to deal exclusively with TomaGold until June 30, 2019. The Corporation announced that Kiril Mugerman, Kintavar’s President & Chief Executive Officer, will present at NobleConXV - Noble Capital Markets’ Fifteenth Annual Investor Conference at the W Hotel, Fort Lauderdale, Florida - on Monday January 28th at 11 am Eastern Standard Time. A high-definition, video webcast of the presentation will be available the following day on the Company&apos;s website (www.kintavar.com), and as part of a complete catalog of presentations available at Noble Capital Markets’ Conference website: www.nobleconference.com and on the new investor portal created by Noble called Channelchek: www.channelchek.com. The webcast will be archived on the company&apos;s website, the NobleCon website and on Channelchek.com for 90 days following the event. Alain Cayer, P.Geo., MSc., Vice-President Exploration of Kintavar, is Qualified Person under NI 43-101 guidelines who supervised and approved the preparation of the technical information in this news release. 1 For more information, see the NI 43-101 technical report entitled “« Amended NI 43-101 Technical Report and Maiden Mineral Resource Estimate for the Monster Lake Project » and dated as of May 17, 2018 amends the Technical Report « NI 43-101 Technical Report and Maiden Mineral Resource Estimate for the Monster Lake Project » dated as of May 9, 2018 and filed on SEDAR under the profile of IAMGOLD Corporation.